Govaerts, R. et al. 2018. Narcissus in World Checklist of Selected Plant Families. The Board of Trustees of the Royal Botanic Gardens, Kew. Published on the internet. Accessed: 2018 Oct 22. Narcissus L., Sp. Pl. 1: 289. 1753; Gen. Pl., ed. 5: 141. 1754. Lectotype species: Narcissus poeticus L. (designated by N. L. Britton & A. Brown, Ill. Fl. N.U.S. ed. 2. 1: 532. 7 Jun 1913, supported by Hitchcock, Prop. Brit. Bot. 144. Aug 1929. Ajax Salisb. ex Haw., Syn. Pl. Succ. : 326. 1812. Argenope Salisb., Gen. Pl. : 102. 1866. Type species: A. serotina Salisb. Assaracus Haw., Monogr. Narcissin. : 4. 1831. Type species: A. capax Haw. Aurelia J.Gay, Ann. Sci. Nat., Bot., IV, 10: 95. 1858. Autogenes Raf., Fl. Tellur. 4: 20. 1838. Calathinus Raf., Fl. Tellur. 4: 21. 1838. Chione Salisb., Gen. Pl. : 100. 1866. Chloraster Haw., Philos. Mag. 63: 103. 1824. Codiaminum Raf., Fl. Tellur. 4: 21. 1838. Corbularia Salisb., Trans. Hort. Soc. London 1: 349. 1812. Cydenis Salisb., Gen. Pl. : 99. 1866. Type species: C. poculiformis (Haw.) Salisb. Diomedes Haw., Philos. Mag. 62: 440. 1823. Ganymedes Salisb., Trans. Hort. Soc. London 1: 353. 1812. Type species: N. cernuus Salisb. Helena Haw., Monogr. Narcissin. 13. 1831. Type species: H. gracilis (Sabine) Haw. Hermione Salisb., Trans. Hort. Soc. London 1: 357. 1812. Illus Haw., Monogr. Narcissin. : 4. 1831. Jonquilla Haw., Monogr. Narcissin. : 7. 1831. Moskerion Raf., Fl. Tellur. 4: 21. 1838. × Narcibularia H.R.Wehrh., Gartenstauden 1: 204. 1929. Oileus Haw., Monogr. Narcissin. : 4. 1831. Panza Salisb., Gen. Pl. : 99. 1866. Type species: P. bicolor Salisb. Patrocles Salisb., Gen. Pl. : 100. 1866. Philogyne Salisb., Trans. Hort. Soc. London 1: 355. 1812. Plateana Salisb., Gen. Pl. : 100. 1866. Prasiteles Salisb., Gen. Pl. : 102. 1866. Queltia Salisb., Trans. Hort. Soc. London 1: 351. 1812. Schisanthes Haw., Suppl. Pl. Succ. : 128. 1819. Stephanophorum Dulac, Fl. Hautes-Pyrénées: 133. 1867. Tapeinanthus Herb., Amaryllidaceae 190. 1837. Tityrus Salisb., Gen. Pl. : 101. 1866. Tros Haw., Monogr. Narcissin. : 5. 1831. Veniera Salisb., Gen. Pl. : 101. 1866. Linnaeus, C. 1753. Species Plantarum, Tomus I: 289. Linnaeus, C. 1754. Genera Plantarum, ed. 5: 141.
International Plant Names Index. 2012. Narcissus. Published online. Accessed 6 October 2012. Tropicos.org 2018. Narcissus . Missouri Botanical Garden. Published on the internet. Accessed: 2018 Oct 22. Farr, E.R. & Zijlstra, G. (eds.) 1996 onwards. 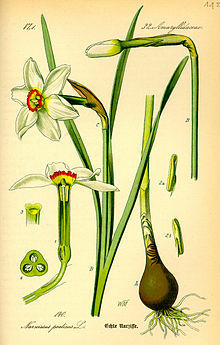 Narcissus in Index Nominum Genericorum (Plantarum). Accessed: 2018 Oct 22. For more multimedia, look at Narcissus on Wikimedia Commons.